Height Adjustable: 46 to 76"
This B&H Kit combines a pair of Auray SS-4420 Steel Speaker Stands with two black speaker stand skirts and a speaker stand bag to create a mobile speaker stand setup for weddings, banquets, or any event needing a clean and elegant appearance. The SS-4420 Steel Speaker Stand from Auray is built for durability and it can support speakers weighing up to 100 pounds. It features a telescoping center column with five height adjustments ranging from 46" to 76". It also features collapsible legs for portability, as well as non-slip feet for traction on surfaces such as dance floors and stages. 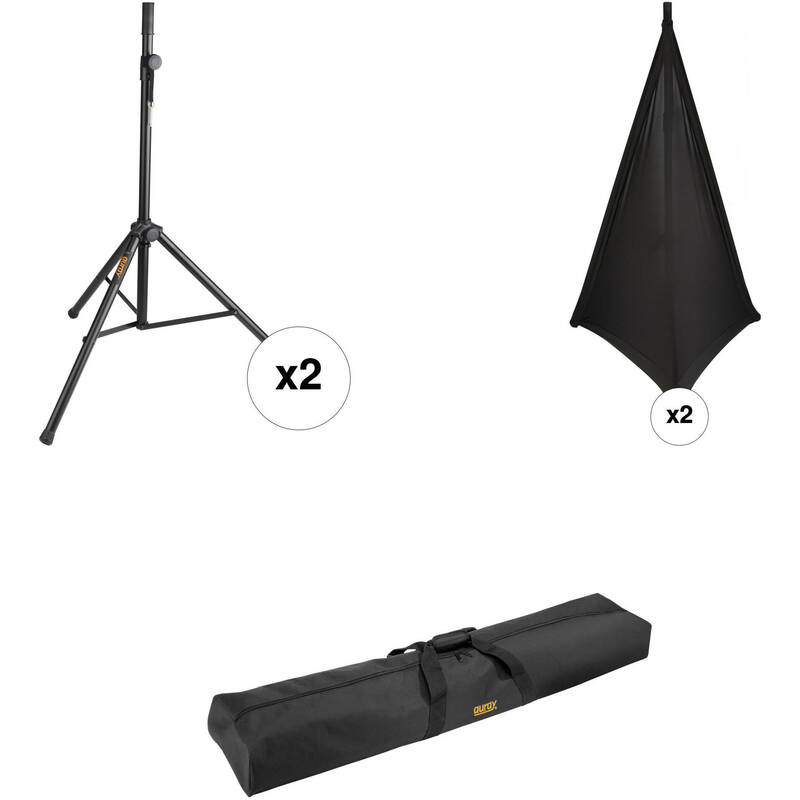 Styled in black, the Pyle Pro PSCRIM2B is a 2-Sided scrim for DJ speakers and light stands. It offers a neat look on both the stage and in the studio, allowing you to conceal cables and wires neatly, or even to add decorative lighting effects. Indeed, you can place an LED light projection source inside the scrim to add a cool night-club effect. The scrim is made from a thick spandex material, so it can be applied to virtually all tripod stands. The PSCRIM2B is compatible with all manners of stands. It quickly mounts and unmounts thanks to its hook-and-loop fasteners. With the PSCRIM2B, you can focus on the sound while giving the audience a memorable visual presentation. The scrim is machine washable, and comes with a carry bag and a set of hook-and-loop fasteners. Box Dimensions (LxWxH) 39.5 x 5.3 x 5.0"
Box Dimensions (LxWxH) 7.7 x 5.35 x 2.7"